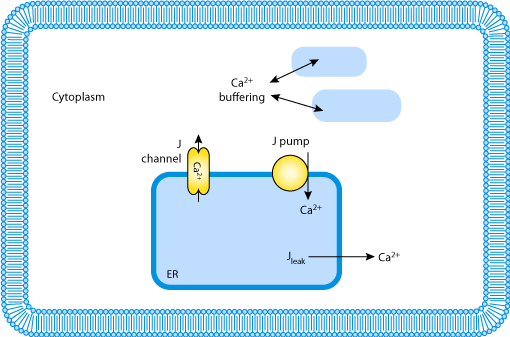 refilling of the endoplasmic reticulum (ER) calcium stores via sarcoplasmic endoplasmic reticulum ATPase (SERCA) pumps. The calcium response to IP3 release and its subsequent degradation were modelled using Vitual Cell software. By combining experimental and modelling approaches, IP3 and Ca2+ time courses can be directly compared. Derived from workspace Fink, Slepchenko, Loew, 1999 at changeset 6fb936940762.